The National Cherry Festival tradition began in 1910 with the "blessing of the blossoms" a religious prayer ceremony for a good cherry crop. Appealing to the gods for a bountiful crop is an ancient tradition that began shortly after the advent of farming. Similar ceremonies have been conducted in many cultures since ancient times. At the turn of the 20th century, when cherry farming began in earnest in the Traverse City area, the local cherry growers got together and asked their priest to bless their crop. Over the years more orchards were planted and the ceremony grew as cherries became more important to the region’s economy. In 1925, the cherry growers partnered with Traverse City merchants to create the "Blessing of the Blossoms Festival" to promote the region and the cherry business. High School honor student Gertrude Brown beat out 72 other contestants to become the first Cherry Blossom Queen after her name was drawn out of a hat. The festival included a parade through downtown Traverse City that was recorded by newsreel cameras. The Festival Parade featured marching bands, war veterans and 52 floats made from decorated trucks, cars and wagons. Beginning in 1926, the Cherry Festival Queen was selected by popular vote. The photos of all 34 nominees were printed in the local paper along with a ballot form. That year, Charlotte Kearns won a decisive victory over the other 26 candidates with 702 votes out of the more than 5,000 that were cast. Her parade was delayed for 45 minutes because the newsreel cameras hadn’t shown up yet. One of the more unusual floats was a scene from a WW I battlefield with a wounded soldier holding up several German helmets under a sign that said, "Who Said We Couldn’t Fight?" In 1926, the tradition of baking a huge cherry pie and presenting it to the US President began. Hawkins Bakery in Traverse City baked a pie that weighed 42 pounds, was three feet in diameter and contained more than 5,000 cherries. The giant pie had to be loaded into a car via its tilting windshield and then into a specially built wooden box in the back seat. 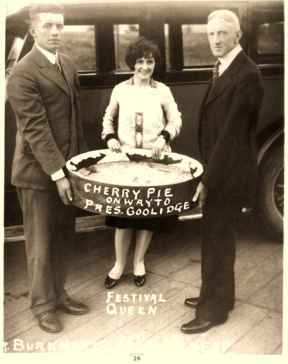 It took three days to drive the pie from Traverse City to President Coolidge’s summer White House at White Pine Camp in Upstate New York’s Adirondack mountains, but the pie arrived none the worse for wear and President Coolidge was delighted. A late frost ruined the cherry crop in 1927, causing the celebration to be canceled. In 1928, the Blessing of the Blossoms was renamed the Michigan Cherry Festival and Michigan Governor Fred Green was on hand to crown the queen. In 1930, the festival was expanded to three days, with more parades, an air show, a boat race, entertainment, sports, and many other events. President Herbert Hoover attended the opening day ceremonies, but after being presented with his cherry pie he was overheard remarking to an aide, "Give it to the poor." Hoover had reason to be in a dour mood because the stock market had crashed just seven months earlier and the nation was plunging into the Great Depression. In 1931, the state legislature passed a resolution making the festival a national celebration and renamed it The National Cherry Festival. Seven US Navy ships docked in Traverse City and 3 companies of sailors marched in the parade that year. The 1933 parade featured a beer truck that dispensed beer all along the parade route to celebrate the end of Prohibition. The first "Dog Show and Parade" was held in 1939, and prizes were given to the dogs who were the biggest, smallest, fattest, thinnest; had the biggest ears, smallest ears, longest tail and shortest tail. In 1941, boxer Joe Louis, "The Brown Bomber" attended the festival and refereed several Golden Gloves boxing matches. During the World War II era 1942-48, the Cherry Festival was suspended, but it has been held every year since. The Anheuser-Busch Clydesdale horses made their first appearance in the Cherry Royale Parade in 1953. In 1963, the first Sand Castle Tournament was held on the beach at Clinch Park. The 1967 festival featured a display by the US Navy of a simulated atomic attack totally destroying a miniature village. After the blast, SeaBees administered first aid to the miniature victims. A rather dubious presentation, to say the least. The Mummer’s Parade had always been a strange affair with people dressing up in wild costumes and acting out, but in 1967, the parade reached a new low in questionable taste. The "King of the Mummers" was riding on the Cherry Festival Queen's float in a crown and full-length mink coat, sitting on a toilet while smoking a cigar and occasionally pulling up his coat to expose his rear end. That stunt put an end to Mummer’s Parades in Traverse City. In 1970 the celebration began with a two-minute "Festival of Noise" with everyone in town making as much noise as possible in every imaginable way possible, including car horns, banging on washtubs, bells and musical instruments of every description. 1973 featured the first "Milk Carton Regatta." Boats were required to use milk cartons as their primary means of flotation. The Great Lakes Maritime Academy took the prize for the most milk cartons by using 1,800 on their craft. The "Bean Pot" built by Chuck’s Sport Shop won the race. Darryl Nelson won the prize for the most original entry—a contraption shaped like a water wheel. The 1975 Cherry Royale Parade was the biggest ever at 180 entries and attended by over 300,000 people. It was led by President Gerald Ford, a Michigan native and former U.S. Senator. The National Cherry Festival has continued to expand over the years and The Cherry Royale Parade has become one of the largest parades in the Midwest. The 8-day festival brings nearly one million visitors and about 26 million dollars to the Grand Traverse area. Among the many attractions are three parades, a classic car and truck show, an International World Cup Beach Volleyball Competition, live music, a cherry pie eating contest, turtle races, a fishing contest, bingo, a pet show and of course, the selection of a Cherry Festival Queen. There were about 150 events and activities, and over 85 percent of those were free, including the giant fireworks display over West Grand Traverse Bay that closed the festival. Hotel rooms in Traverse City are usually all booked up well in advance of the Cherry Festival, so if you’d like to stay overnight, you need to make your reservations well in advance. Visit the National Cherry Festival’s web site at http://www.cherryfestival.org/ for more information.